Finland is a tiny country, but surprisingly one of the greatest oats producers in the world. Oats are the Top 1 crop in Finland. The country produces 14 % of European oats, making Finland the 2nd largest exporting country of oats. The amount of production is approximately 1 100 000 tons. 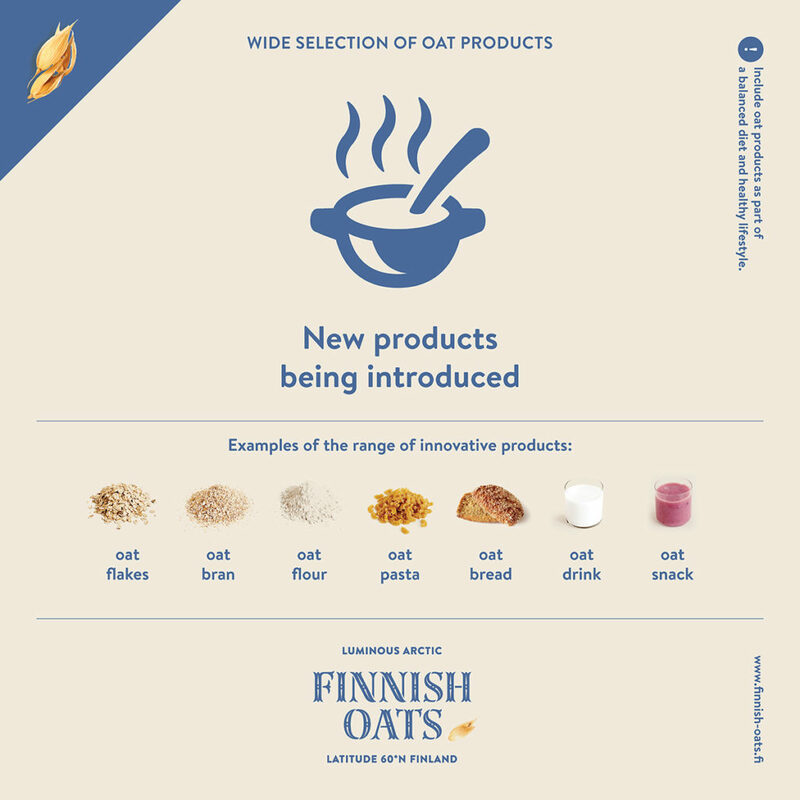 Finland also produces organically grown oats, representing a significant amount of global production. Typically 80-90% of the Finnish organic oats production goes to international markets.The production processing of gluten free oats is growing significantly. Finnish oat research has become world famous. Also the expertise in the treatment of healthy nutrition and special diets, for example, weight management and diabetes, is utilized in the development of most innovative oat products. The research enhances the international competitiveness and value of Finnish oats through the understanding of its various food uses, consumer requirements and grain quality research. Ready–to-eat Finnish oat products: dairy alternatives such as fermented oat snacks, oat drinks, coffee creamers and smoothies, oat ice-cream, oat crisps and chips, oat bran and powders, oat-based baby-foods and oat breads containing up to 100% oats. For cooking: protein-rich plant-based ingredients (pulled oats, oat mince and oat block) and ready-to-eat balls or patties for meals, oat pasta as well as oat-based creamlike dairy alternatives for the main dishes and desserts. gluten free oat products for those end users who are on a gluten free diet or who have coeliac disease. The purity and safety of Finnish gluten free oat products has been ensured all the way through the supply chain, from the farm to the end products. FOR PRIVATE LABEL: The Finnish oat industry has high quality standards and they use pure raw materials with constant quality control. Jointly with their customers, Finns are ready to develop value-added Private Label oat products. FOR OTHER INDUSTRIES: For instance, the cosmetics industry can use purified, specially developed Finnish oat fractions in their processes. FOR FEED OAT PURCHASERS: Finnish oats can be used in the feed of all domestic animals and pets. Oats are appreciated in feeds because they have a high nutrient and energy value. You can read more about oats as feed here, Oat as Feed. Look in the map where Finnish oats is produced and processed.